Yo yo yo, my fellow Big Brother fans. Yes, it’s another Sunday evening episode, which means that there won’t be too much exciting news. Sure, we’ll see the results of the semi-endurance competition that began as time ran out on Thursday’s episode, but outside of that we’ll have the usual HOH room reveal, a bit of scheming, and the nominations. 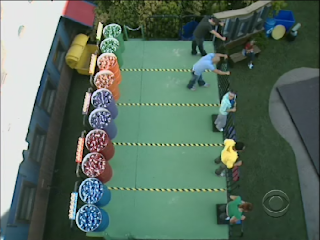 So we begin with the HOH players on top of a platform, attempting to drop cans into a pair of tubes. Jordan says it’s nervewracking, but that Jeff needs to win as he’s the only one she trusts. Kevin says it’s important for him or Natalie to win, as they’re the only ones left. Russell and Natalie pretty much repeat what we already heard. We continue with more reaction to Lydia’s eviction. Russell laughs at how Lydia didn’t hug anybody but Kevin, while Jordan babbles about how she was such a drama queen. “She made our lives here a lot tougher than they should be.” Kevin apologizes to Natalie for voting against her. Back to the game. Kevin is now in the lead until Michelle ties it at four apiece. Poor Natalie is in last place. That’s when the sliding boards begin to move, and they all complain about how hard the game has become. Kevin and Jeff are now fighting for the lead, but Russell’s stomping around is causing problems for Jeff. Natalie and Russell are starting to catch up to the other three, and Natalie again describes how tough it is to drop cans into these tubes. Jeff adds that he came up with a strategy of pulling the tab to somehow aim better. As they continue to play, Jordan reads a card that states the two players with the lowest number of cans will be this week’s “have nots”. Kevin says that “put a little fire underneath my feet”. It’s still between Kevin and Jeff when we see Kevin nail two at once. We see a nice little score when a can lands on the platform, and somehow drops in anyway. Russell has now jumped into second place when Jordan reads another card about how special gold cans get to close down other players for 60 seconds. Michelle opts to not use them so that she doesn’t become a target. Russell does not have that issue, and will do anything to win. Kevin is well on his way to winning when Russell opts to use a gold can to freeze out Kevin. He makes it, but Kevin is still confident he will win. Jeff says that he has “gotten into a rhythm, and catches up during that time. Meanwhile, Kevin has decided to try to use two gold cans to stop Russell, and indeed makes one. Jeff says that this actually helped him, as without Russell’s stomping around he was able to focus. Jeff and Kevin are indeed tied at 22, and Kevin says it caused him to “step it up”. Kevin grabs two gold cans to use on Jeff, but misses both. Jeff makes another one to tie him, and after we see Kevin miss two, Jeff finally makes the winning card. Jeff is HOH, with Michelle and Russell this week’s “have nots”. Jeff and Jordan are obviously ecstatic, while Kevin and Natalie are bummed because he knows he’s going to be nominated. Russell says that he “should” be happy, but because he’s the “strongest competitor in the house” he’s worried. To add some phony drama, Jeff says it’s time to make a bold move. Yeah, right. After commercials, we see everybody babbling in the kitchen about making it to the final six. Natalie remarks that everybody but her and Kevin have been HOH. “We’re losers, big time.” Jeff notes that he was “right there”, but Kevin complains that he always chokes. In the diary room, Kevin hopes to continue to play the “floater game”, and convince Jeff that there are bigger players to go after. 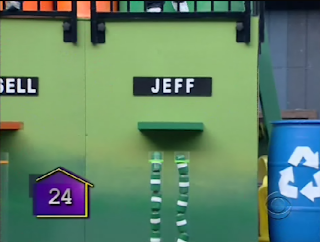 Before they can talk about such a deal with Jeff, we have to endure the HOH room reveal. Jordan says that Jeff’s childhood haircut reminds her of “dumb and dumber”. Um, yeah, Jordan, I’m sure that makes you feel right at home. Kevin adds that every picture is “various stage of Jeff hotness”. The letter is like all, the family loves him and watches every week. We get it, BB. With one fluff segment over, we move on to another one, as Jordan hints that she’d like Jeff take her on the Hawaiian vacation he won. Yeah, CBS, push the showmance angle. Jordan babbles nonsense in the diary room about how men think with their penises and not their minds, and that if she went to Hawaii all they’d do is kiss and cuddle. Sure you would. On to gameplay - Michelle and Russell are heading up to HOH because Russell wants to know where he stands with Jeff and Jordan. Jeff brings up what Kevin lied about Russell wanting to split the couple. Russell says that “they” are going to say what they need to say to “make a last stand”. He wants to know what the advantage would be to do that, and asks Michelle to verify that this conversation never happened. She really doesn’t answer in a way to help Russell, but he does make good points on his own. Once they’ve left, Jordan tells Jeff that she doesn’t trust either of them. She believes Kevin and Natalie over them, and they decide to head outside to talk to Russell again. Jordan heads right to Russell, and they have the same argument they just had. In the diary room, Russell says he has thought about going after Jeff, but that he never told that to anybody. Jeff complains in the diary room that he never got the answer he wanted. Um, you did if you had listened. Time for more fluffy material. Jeff is watering the plants in the backyard, and Michelle is acting like she cares. At least we get a pic of Jordan in a bikini enjoying the “garden boy” without a shirt. Kevin also enjoys watching him “water with his hose”. Ugh. As if that’s not enough fluff, we get the big reveal of what the have nots get to add to their slop diet - churros and chitlin. Both Russell and Michelle are not excited, but Kevin is bummed that they got something worthwhile to eat when he was forced to endure squid and squash. Ok, back to game play. Wait, never mind. Natalie is telling everybody that she was a professional poker player, and she adds in the diary room her lie about not being 18. If Jeff had any brains, he could put two and two together. Unfortunately, he’s just a hot gardener. Natalie makes a crack about Russell’s game play, and they end up going off on each other - live and in the diary room. Russell is now seen talking to Michelle, worrying that Jeff is going to “flip the script”. Just cue to a few paragraphs ahead to see how this conversation goes, but Michelle decides to head upstairs to find out what’s going on. Russell tells her to “go for it”, but in reality he should be with her as Michelle is not good at this part of the game. Jeff adds the usual “I’m the HOH; the decision is mine” babble. Michelle goes back down and tells Russell the “plan’s on”. Russell says that he still suspicious, though. Time for yet more fluff. Jeff and Michelle are babbling about tans, and Michelle’s job as a neuroscientist. Michelle says in the diary room that everybody in the house is clueless about what she does, and we see more filler as she explains to Jeff what she does. Wake me up when this is over. Back to game play - we see Natalie and Kevin corner Jeff in the backyard, and we hear Natalie talk about how with nominations coming up she needs to come up with a proposal to stay off the block. Kevin starts with a nice lie about how they’re strategy has always been to be truthful. Oh god, please tell me Jeff doesn’t buys into this crap. Natalie adds that a deal with them would at least give them people worth trusting, instead of people who are “shady”. She adds that she also heard what Kevin had reported, and Jeff says that he does believe them. Despite this, though, he says that he’s going to put them up but will take one of them off to backdoor Russell. As you may expect, Jeff runs into the bedroom to inform Jordan of this new plan. “Or I could put up Russell and Michelle. And be like, ‘something going on between you two. I don’t know what it is. You guys didn’t come clean with me. One of you guys has got to go.” He would then tell Michelle that she’s not the target. Jordan wants Russell out, but she questions whether they can trust Natalie. Good point, my silly little southern minx. “I trust Natalie”, she finally adds. Nooooooooo! So it’s finally nomination time. 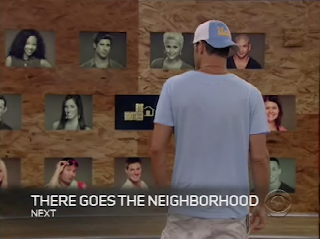 As the script always reads, Jeff stares at the wall of pictures while everybody babbles about how they’re not nominated. Interestingly, Russell says the smart plan would be to put himself and Michelle up. The first key pulled, though, belongs to Russell, followed by Michelle and Jordan. Yes, Natalie and Kevin are nominated! Jeff jokes that he nominate them because he didn’t like them, as Jordan says that he doesn’t tension. Nobody really says anything worthwhile in the last quotes of the night, so I’ll sign off right here. See you Tuesday! I dunno if I said this before, but that was the lamest HoH comp in a while. It wasn't even worth dragging out into the Sunday episode.